A drug-based therapy appears to restore breathing in rats paralysed from the neck down by a spinal injury, according to scientists. They hope their "exciting but early" findings could ultimately help free patients from ventilators. The pioneering work, in Cell Reports, suggests the brain may not be needed for respiration if a nerve pathway in the spine can be awakened. More studies are now needed to better understand and exploit this system. Normally, messages to and from the brain control breathing. If the spinal cord is damaged high up in the neck, these messages can't get through and a person will need mechanical assistance or a ventilator to breathe. Experts have been looking at ways to repair spinal cord damage to reconnect with the brain, but the latest therapeutic approach, being explored at Case Western Reserve University, is entirely different. Dr Jerry Silver and colleagues believe they have found an alternative nerve pathway for breathing in the spinal cord itself. The researchers used a drug and a light therapy known as optogenetics to dial up this spinal system. It appeared to control the body's main muscle of respiration - the diaphragm, a dome-shaped sheet of muscle that sits underneath the lungs, separating the chest from the abdomen. The live adult rats that they studied had severed spinal cords, meaning the brain could not be the source of the diaphragm movement or breathing that the researchers saw after they administered the therapy. They believe the treatment works by stopping other nerve signals that would normally silence the spinal system that they found. Dr Silver said: "This is a primitive response that has been kept in the spinal cord for emergencies, like gasping and screaming in response to danger." Although the researchers say the movements they saw resembled breathing, it's not clear yet if it would be enough to sustain life. They plan more animal studies to check. Dr Silver said: "Ultimately, the goal of this research would be to free people with these neck injuries from having to use mechanical ventilators. "Infections and other complications from mechanical ventilators are a leading cause of death after spinal cord injuries." Dr Thomas Becker, an expert in neuroregeneration at Edinburgh Medical School, said: "This is an important discovery on the fundamental working of the spinal cord. 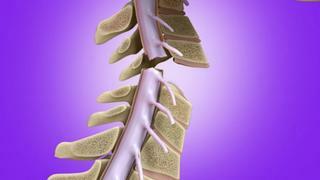 "Understanding the spinal network is the first step toward future therapies. "This knowledge could be used for future therapies to restore breathing in patients who lost nerve connections from the brain as a consequence of spinal cord injury."